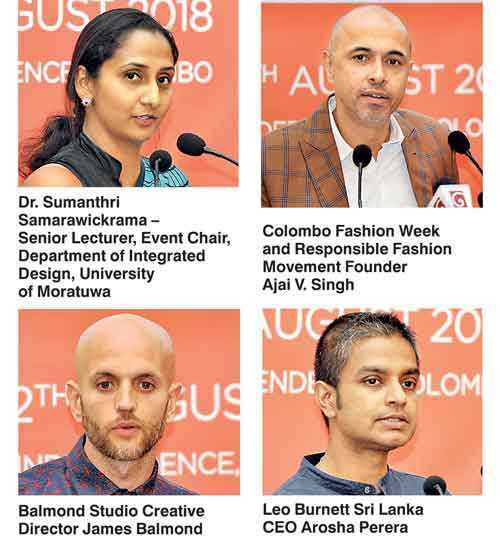 The Department of Integrated Design of the University of Moratuwa is set to host a week-long celebration of product design, fashion and lifestyle design, media and communication design – the highly anticipated ‘Sri Lanka Design Week 2018’. The event will take place from 7-12 August at Arcade Independence Square, Colombo and will provide a platform for the program’s students, graduates and industry best practitioners, to showcase their work and design capabilities across a broad spectrum of design specialisations. Presented by Design Code, the organising body of the Department, the initiative is a creative collaboration between the university and Leo Burnett Sri Lanka, Balmond Studios, the Lanka Association of Designers and Design Development Corporation. Cargills (Ceylon) PLC has stepped forward as the platinum sponsor of the event, with Hirdaramani Group of Companies as the Gold sponsor, Antyra Solutions being the digital partner and Print Care serving as the official print partner. Other partners that have extended their support to the initiative include; Atlas Axillia, Anim8, the Softwave Group of Companies, 99x Technologies, Impulse, JF&I Packaging Ltd., Barefoot and Lanka Tiles PLC. Sri Lanka Design Week 2018 will celebrate interactions, integrations and the innovations in creativity and design, amongst students, educators, practicing professionals and designers. The University of Moratuwa has long been heralded as a pioneer of higher design education in Sri Lanka, and this unique event will help to strengthen its position at the forefront of creative-based education in the country. Students from the university’s Department of Integrated Design, who are part of a four-year Bachelor of Honours Degree program will be able to share their work and creative concepts at the event. These students are specialising in a wide variety of design disciplines’. They are continuously focusing on merging creativity with functionality to create signature designs that are unique and have an individual identity. The week will feature a compilation of mini-events around the theme of Design in Sri Lanka – and will be dedicated to creating awareness of and conserving novel design knowledge. The event will be kick started with an inauguration ceremony, which will be open to all members of the public to attend. A keynote address will provide a comprehensive overview of this year’s theme by Prasoon Kumar, Co-Founder and CEO billion Bricks| President*s Design Awardee | TEDx speaker | Forbes contributor. He will speak on designing a nation: who cares! The inauguration will be further bring glamour with the awarding ceremony of the Sri Lanka Design Award 2018, in partnership with Cargills (Ceylon) PLC. The following four awards will be presented: Young Sri Lankan Designer Award, Young Global Designer Award, Young Sri Lankan Designer of the Year 2018 Award and the ‘Most popular Design’ Award. The first two awards will be given to the respective fields of design: Product Design, Fashion and Lifestyle Design, Media and Communication Design. The official design exhibition will thereafter be opened. The exhibition will be opened to the public on each day until 12 August from 8:30 a.m. to 7:30 p.m. The exhibition space will include an interactive live studio space to instil the designer in you. Along with the work of the university’s undergraduates, there will also be an area dedicated to the appreciation and celebration of selected companies in Sri Lanka that have excelled in the local design industry and facilitated its transformation and growth. The Design Research Conference 2018, one of the main highlights of the week, will be held on 11 August from 9 a.m. to 2 p.m. at the Sports Ministry Auditorium. The event will be an international peer-reviewed conference focused on design research that seeks to examine the importance of design knowledge, whilst understanding the connections between design, theory and pedagogy. The conference keynote speaker will be Praveen Nahar, Product Design Senior Faculty, National Institute of Design, India. The conference vision speaker will be Sonia Manchanda, a Design Strategist and Graphic Designer with more than twenty years of experience in building creative organisations in India. The theme of the conference will be centred around the ‘Future of Integration in Design’ and the conference will provide insight on several research papers by student presenters. The ‘Design Forum’ will be held on 11 August at 7 p.m. to 9 p.m. at the Sports Ministry Auditorium. The forum will be an in-depth panel discussion that will provide an opportunity for attendees to discuss industrial views, needs and the expectations of design practice and design thinking. The panel will consist of Malik J. Fernando – Managing Director of Resplendent Ceylon, Chevaan Daniel – Group Director of The Maharaja Organisation and Peter D’ Almeida – Managing Director and Chief Executive of N-able. It will be moderated by Dr. Sumanthri Samarawickrama from the Department of Integrated Design, University of Moratuwa. A series of design talks and workshops will also be held over three days at the Sri Lanka Foundation Institute, highlighting the importance of design and how it integrates with other aspects of creativity. Nine reputed designers and academics from both the local and international industry will conduct talks and workshops related to specialising fields; Product Design (8 August), Media & Communication Design (9 August) and Fashion & Lifestyle Design (10 August). Thus, one day will hold three design talks and one workshop related to each field. Interested participants for the talks, workshops, Design Forum, Research Conference should pre-register on www.designcode.lk in order to attend. An ‘Interactive Live Studio Space’ will be dedicated to sharing a few of the skills acquired by the students spread through the fields of Fashion and Lifestyle Design, Product Design, Media and Communication Design. An appreciation for craft will be instilled as a core value within all the live studio activities. Through the studio component of the event, we expect to spark a passion for designing within the participants, so that they can tap into their own potential and skills with renewed zest and motivation. The Live studio activities will take place on 8, 9 and 10 August, at the Arcade Independence Square from 9:30 a.m. to 7:30 p.m. and will be opened to public. For more information you may log in to www.designcode.lk. The ‘Creative Thinker’ workshops will be aimed at school children, from selected Western Province schools, and will focus on nurturing young design minds on how to think out of the box. The workshop will guide young participants on creative thinking and help them to generate novel ideas. This event will take place on 12 August at the Arcade Independence Square and is partnered with Atlas Axillia Co. Ltd. This year’s Sri Lanka Design Week 2018, will conclude with an extravagant fashion show curated by Ajai Vir Singh on 12 August at the Arcade Independence Square from 6:30 p.m. onwards. The show will feature, work that has been created by students of the university’s Department of Integrated Design. The show will include the Graduating batch’s’ final year fashion collections, level three Fashion and Lifestyle Design projects, level two Culture Code 2018 Fashion drapes. It will also showcase designs of student group projects for the Responsible Fashion Hackathon by Design Development Cooperation. The most responsible fashion designer will be presented the ‘Best Responsible Fashion Designer Award’ during this show. The Fashion show is partnered with Hirdaramani Group of Companies. The show will conclude with a lifetime felicitation award given to Chandramani Thenuwara, an individual who has made a substantial contribution to the growth of design in our country. Sri Lanka Design Week 2018 will deliver a range of platforms and experiences that will celebrate design on multiple levels. Set to inspire the public as well as young professionals, students, and industry movers and shakers, whilst fuelling meaningful discussions that will shape the industry, this event will play a pivotal role in shaping past, present and future generations of Sri Lankan designers.